Buckle up and dive headfirst into a dystopian world devoid of society, law and order. Rage 2 delivers a carnival of carnage where you can go anywhere, shoot anything, and explode everything. 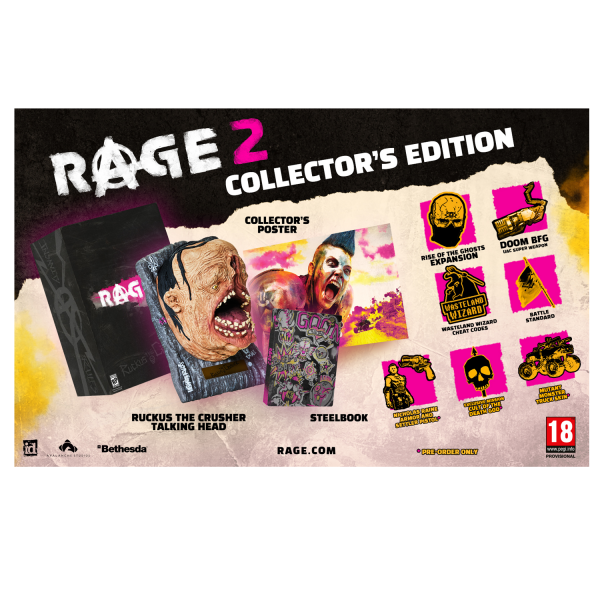 The limited collector's edition includes a "Ruckus The Crusher" Talking Head, a poster and a steelbook plus the "Rise of the Ghosts" expansion, the DOOM BFG, Wasteland Wizard Cheat Codes and a Battle Standard. Pre-Ordering the game grants you 4 bonuses: The exclusive mission "Cult of the Death God", the Settlers Pistol, Nicholas Raine's Armor and the Monster Truck. Please note that this is the English version of the game!